The Burmese can be one of four colors. 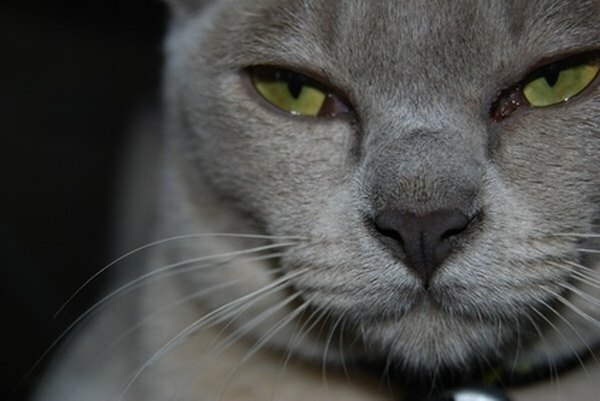 The most obvious trait of the Burmese cat is his coat — a shorthaired, dark, shiny, chocolate brown. These cats from Burma, now Myanmar, have been around for thousands of years. They were first brought to the United States in the early 1930s. Although Burmese cats are traditionally brown with green or gold eyes, they were bred in the United States with the Siamese. Burmese still mostly have green or gold eyes, but some have the Siamese blue. The Cat Fanciers’ Association now recognizes four coat colors for the Burmese: sable — the original brown color — champagne, blue and platinum. Burmese are solid cats; they might look thin and lightweight, but many people have described them as “bricks wrapped in silk,” according to the Cat Fanciers’ Association. Some Burmese are compact with round heads; others have a longer body with a long, thin face. The compact cats with the round heads are show-quality. Burmese cats have a pleasant-sounding meow that’s not as loud as the Siamese's. The sound Burmese cats make is almost as if they are hoarse from too much talking, according to PetMD. Burmese cats are the dogs of the cat world; they often will follow you around the house and eagerly await your arrive home. Most Burmese enjoy riding in a car if you get them used to doing so while they are young, but they won’t go all doggy on you and hang their heads out the window. Some Burmese even play fetch. Burmese are intelligent, affectionate and playful, and they often like to rule the household. But most of all, they love to sit in your lap. Females and males tend to have different temperaments: Females generally become more attached to you and are more curious. Males like to hang around you, too, but have personalities that are more laid-back. The Burmese is far from a street cat. In fact, he has little natural survival skill and would be entirely too trusting outside on his own. A Burmese does not possess the ability to fight predators, catch food or watch for cars. This is definitely an indoor cat. If you work in an office or a boutique where you can bring your cat, your Burmese should be just as comfortable there as he is with you at home. Be careful if you do get a Burmese: The Cat Fanciers’ Association said they are addictive, and you might find that you need more than one. What Is the Difference Between Hoarding Cats & Being a Sanctuary?